It seems like there are more dog groomers than ever before. During a drive around your town or neighborhood you will probably pass many storefront grooming salons, and they probably have clever and memorable names based on some sort of dog-related pun. 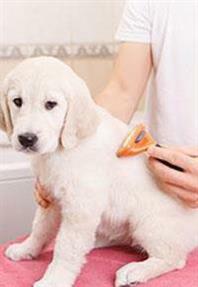 In addition, many of the larger pet supply retailers also offer on-premise grooming services. So, how do you decide which one should have the honor of being your dog's first professional groomer? As with many other dog-related services—such as choosing a vet, a trainer, and a boarding kennel—ask your friends. You can benefit from their good (and not-so-good) experiences with local groomers. You can also consult your vet's office, breeder, and local yellow pages. If you're searching online, see if there are any reviews that have been posted. Don't be shy, ask the groomer about their experience and training. If you're speaking to the manager/proprietor, find out if they will personally be involved with your dog's grooming, or if they will pass your dog off to an employee. And don't forget to ask about the employee's qualifications and training. Find out if the groomer has experience primping your dog's breed. Different breeds have different looks and needs. After all, if you have a Samoyed, you may not feel comfortable with a groomer who seems to spend most of his/her time with Toy Poodles. Ask the groomer about what he/she recommends for your dog's breed, hair length, activity level, etc. Professional groomers are proud of their expertise, so ask to see photos of some of the dogs they've beautified. Specifically, ask to see photos of dogs that are similar to your dog's breed. Visit the groomer's facility to see what it looks like. Is it a clean, calm, and professional atmosphere? Does it look well maintained? Does it reflect the high standards you expect from someone who will service your beloved pooch? During your initial visit to the groomer, watch how he/she interacts with the dogs being groomed. Is there a natural rapport? Does the groomer do a good job of making dogs feel calm and comfortable? If you've never brought your dog to a groomer before, you may not be aware that some groomers offer a wide range of services. Here's a partial list of the many potential services that some groomers provide. Many groomers offer a variety of packages and a wide range of shampoos, conditioners, and other products. Some even offer nail polish and a spritz of doggie cologne. If you want to bathe and "freshen" your dog but you don't feel you need the services of a professional groomer, a self-service grooming salon may be what you're looking for. Self-service grooming salons typically provide specially designed areas to bathe/shower your dog, a variety of shampoos, scissors, doggie-appropriate blow-dryers, plush towels, brushes, and everything else you need to personally primp your pooch. And at a fraction of the cost of a full-service professional grooming session.